The plague hit Liverpool badly. 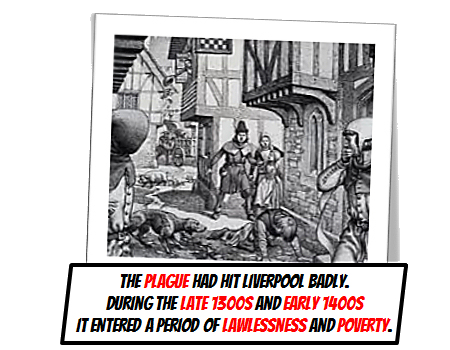 During the late 1300s and early 1400s it entered a period of lawlessness and poverty. 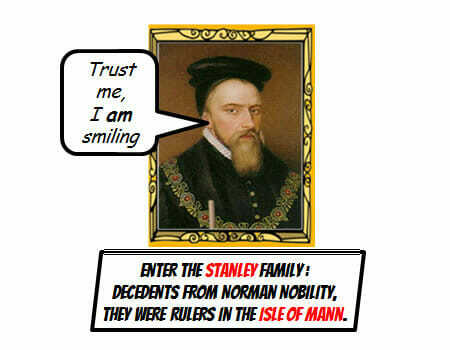 The Stanley family, descended from Norman Nobility, were rulers in the Isle of Mann. 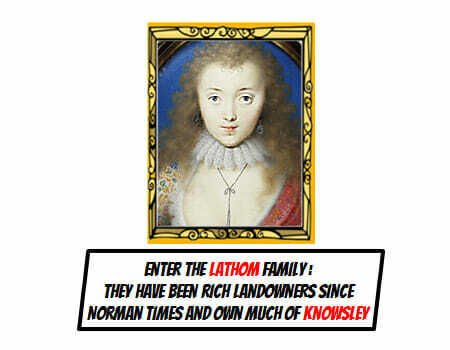 The Lathom family had also been rich landowners since Norman times and owned much of what is now Knowsley. 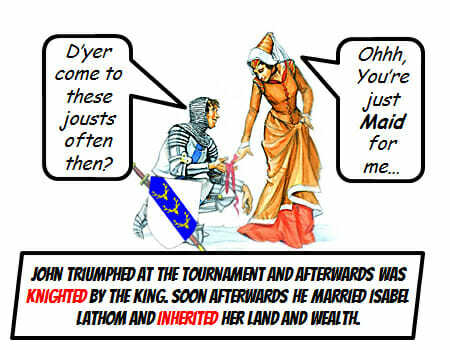 John Stanley mets Isabel Lathom (daughter of wealthy landowners) at a jousting tournament held by King Edward III. 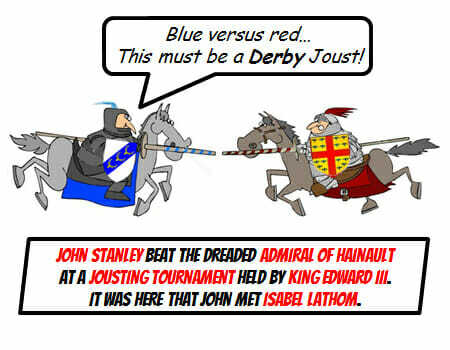 John triumphed at the tournament beating the dreaded French Admiral of Hainault and was knighted by the King. Soon afterwards John Stanley married Isabel Lathom and John inherited her land and wealth. Things could have turned out differently for John Stanley, as Isabel’s father Sir Thomas Lathom was believed to have found a child one day whilst walking in woodland and this child should have rightfully inherited the family fortune. 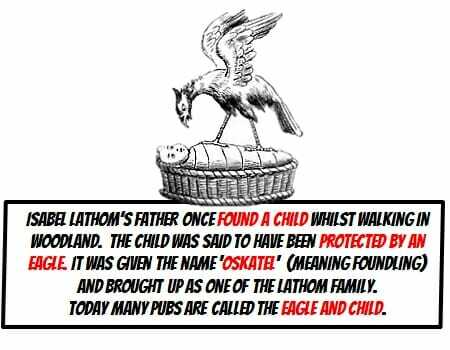 The child, which was said to have been protected by an Eagle, was named ‘Oskatel’ (meaning foundling). On his deathbed Sir Thomas decided to give most of his land over to Isabel and not Oskatel. Today many pubs in the north west are called The Eagle and Child. 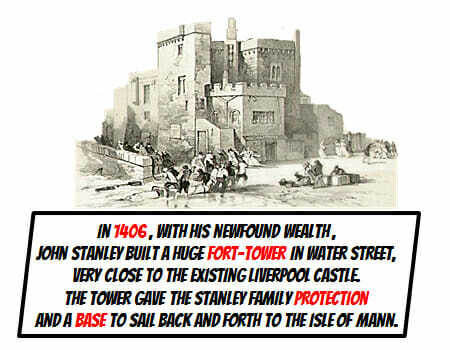 For protection, one of Liverpool’s most important noblemen Sir John Stanley (the lord of the Isle of Mann) built a huge fort-tower in Water Street in 1406. Very close to the existing Liverpool Castle. The tower gave the Stanley family protection to sail back and forth to the Isle of Mann. 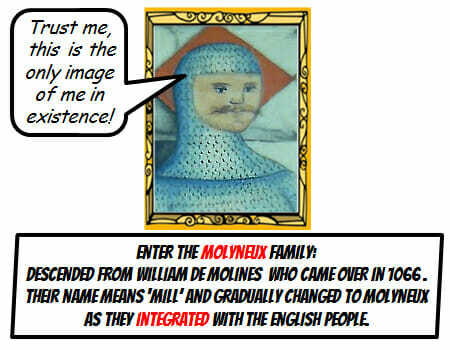 The Molyneux family descended from William de Molines who came over with William in the Norman Conquests – Their name means ‘Mill’ and was gradually changed to Molyneux as they integrated with the English people. 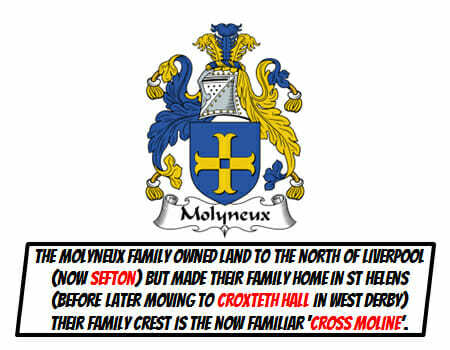 The family ended up owning areas to the north of Liverpool (now Sefton) but made their family home in St Helens (before later moving to Croxteth Hall) Their family crest is the now familiar Cross Moline. 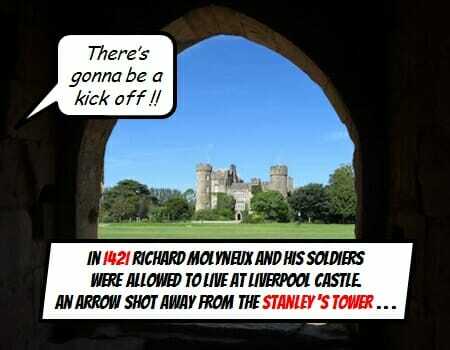 In 1421 Richard Molyneux was allowed to live with his soliders at Liverpool Castle. An arrow shot away from the Stanley Family’s tower. 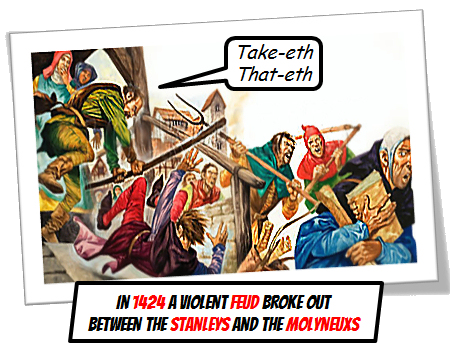 In 1424 a violent feud broke out between Thomas Stanley and Sir Richard Molyneux. 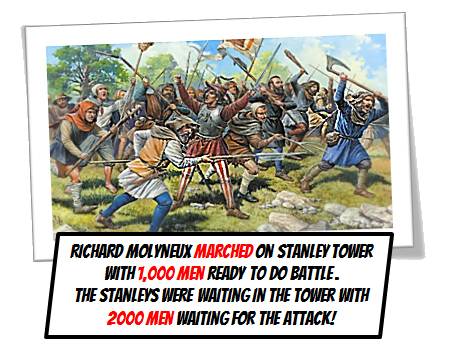 Richard Molyneux marched on Stanley tower with 1,000 men ready to do battle with the Stanleys. The Stanleys were waiting in the tower with double the men – some 2000 waiting for the attack. 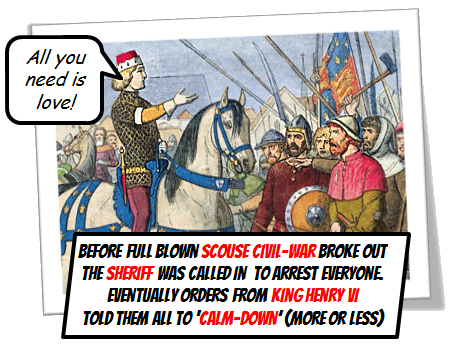 Before a scouse civil-war broke out the Sheriff was called in and eventually an order from King Henry VI told them to ‘calm-down’ (more or less). 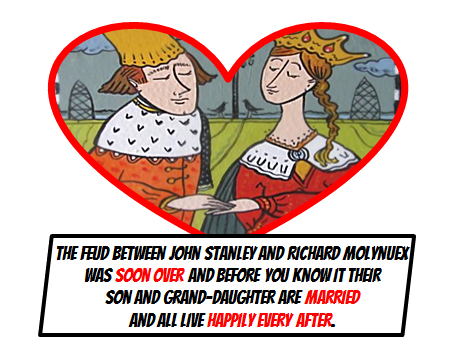 The feud between John Stanley and Richard Molynuex was soon over and before you know it their son and grand-daughter are married and lived happily every after.